Welcome to the Eleanor E. Murphy Branch Library. 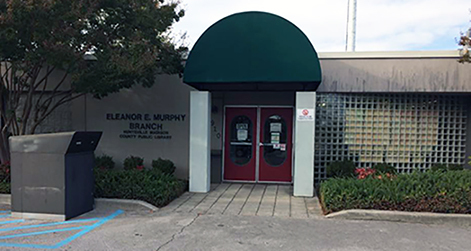 Begun by volunteers from the Civic Association of Parkway Estates and Fleming Hills in 1967, the Eleanor E. Murphy library is in the heart of the Chaffee neighborhood and conveniently located right off of South Parkway. We are excited to call Grissom High School our new neighbor, in addition to Chaffee Elementary School and Whitesburg Pre-K-8. Drop in on your way home or on your lunch break to browse the books or check out a movie for the weekend. Curl up with a cup of coffee on the sofa by our sunny front window to catch up on the news or get in a few more pages of your latest read. Our dedicated children’s librarian offers programs for toddlers through teens, including storytimes, science club, crafts, and writing groups. For adults we offer coloring sessions, craft workshops, and book clubs. Our newest addition will be the Murphy Learning Garden--a place to learn, share, and relax. Visit us today...we love being a part of your South Huntsville way of life! Read more about the Eleanor E. Murphy Friends of the Library. From I-565 East take exit 19A to Memorial Parkway Southwest. Follow Memorial Parkway SW for 5.4 miles (Note: Road will switch from freeway to surface street). Turn right onto Charlotte Dr SW. Contiue on Charlotte Dr SW for less than a mile and the library will be on the right.